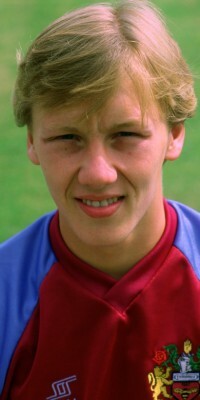 Lee Dixon, I think it is fair to say, is best remembered for his time with his last club rather than his first, but it was at Burnley where he started his career as an apprentice at the beginning of the 1980s. He was recruited through the then Chief Scout Gordon Clayton who, during the 1950s, had been reserve team goalkeeper at Manchester United. At the same time the reserve team goalkeeper at Manchester City was Roy Dixon, Lee's dad. After serving his apprenticeship he signed as a full time professional at Turf Moor, and was soon a regular in the reserves. However, the first team right back was Brian Laws and was not ready to be dislodged. As the 1982/83 season was coming to an end, and Burnley were facing relegation to the Third Division just a year after going up, Dixon got his chance when Laws was ruled out through injury and Dixon made his debut in the last home game of the season, a 2-1 win against QPR, at the age of 19. He played well and he retained his place for the last two games at Leicester and Crystal Palace. There were big changes in the summer at Turf Moor with John Bond coming in as manager, but when the season kicked off Dixon was in the side, preferred to Laws, at Hull. We suffered a 4-1 defeat on the opening day and three days later he was substituted as we went down 1-0 at Crewe in the League Cup. He couldn't have known it at the time but his first team career at Burnley was over. His football career was hardly over though, in fact a long and successful career had hardly started. Not as though things got better for him immediately. Having been deemed surplus to requirements at Burnley he signed for Chester City on a free transfer along with fellow full back Andy Wharton. That hardly enhanced his reputation. They finished rock bottom of the Football League in the days when that didn't mean relegation. By summer of the following year he was released by Chester although he had at least played over fifty games for them. Now 21, he'd been shown the door by two clubs, but his time at Burnley proved to be a help to him with his next step when Martin Dobson, who was Burnley captain when Lee made his debut, signed him for Bury. He had just the one season at Gigg Lane where he was a regular in a side that had won promotion from the Fourth Division in the previous season. He'd only signed a one year deal with the Shakers and, having had a good season with them, it prompted Stoke boss, and former England full back, Mick Mills to part with £40,000 for him, the fee decided by a tribunal. The pacy full back was on his way and his stay in the Potteries was just eighteen months. Then George Graham parted with £380,000 to take him to Arsenal. He'd been signed to replace Viv Anderson who had gone to Manchester United but there was no immediate place for him in the side with Nigel Winterburn preferred at right back whilst Kenny Sansom was at left back. He played occasionally during the second half of that 1987/88 season but when Sansom left it gave him his chance at right back with Winterburn moving to left back. Alongside Tony Adams and David O'Leary (later Steve Bould) the now famous Arsenal back four became the cornerstone as Graham's team lifted two of the last four League titles prior to the launch of the Premier League. Things couldn't have been much better for Dixon, and certainly not in April 1990 when Bobby Robson gave him his England debut in a friendly against Czechoslovakia at Wembley. When he made his next appearance for his country in September of the same year Robson had been replaced by Graham Taylor and Dixon became a regular. When he lined up in that infamous match against San Marino in November 1993, a game we won 7-1 after going behind in the opening seconds, he'd played no fewer than twenty-one times for England with all but one of them starts. With Taylor's demise he lost his place in the England set up although there was to be a one match reprise five and a half years later. By then there had been big changes at Highbury with the arrival of Arsène Wenger and things were getting better. In the 1997/98 he was in the double winning team and then came that surprise England call up in February 1999 when Howard Wilkinson was in temporary charge for a friendly against France. Lee was approaching his 35th birthday but it was to be just a one match recall. The trophies continued to be won by Arsenal and again they won the double in 2001/02 but this was to be Lee Dixon's farewell and at 38 he made the decision to hang up his boots after a fantastic career for both club and country. He's got several interests outside of football. He was involved in a chain of curry houses at one time and is now a stakeholder in a Berkshire restaurant, but he's not been lost to the game. Nowadays he can be seen most Sundays alongside Adrian Chiles on Match of the Day 2, and has become one of the Beeb's top pundits. His retirement at Arsenal came nineteen years after he'd played those few games for Burnley, and there's no doubt that one way or another John Bond and our club got it very wrong when letting him go for nothing. Every club can point to big mistakes when it comes to letting players go, Lee Dixon proved beyond any doubt at all that he was one of ours.